At Simeon Green, Carisbrooke Road, Newport, Isle of Wight. The Memorial Sculpture is not recorded by the IWM War Memorials Archive. The Sculpture is not listed. 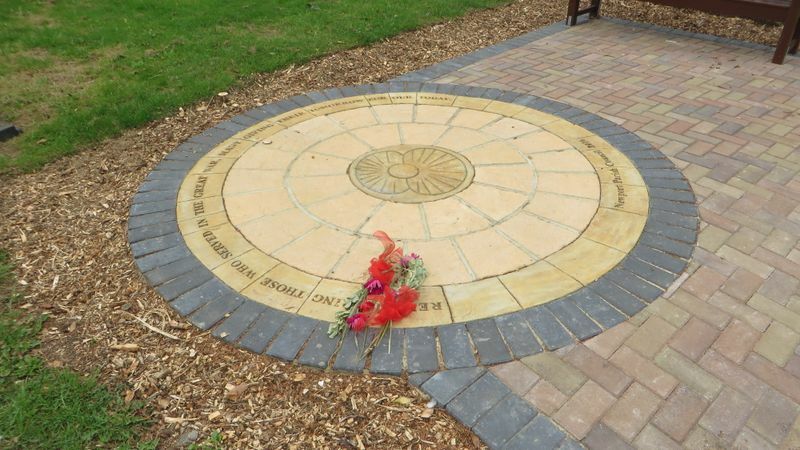 An installation of paving stones with a poppy motif, in commemoration of the men of Newport parish who served and in many cases died, in WW I. The Memorial Sculpture was unveiled on the 14th September 2016. The project was developed by Cllrs Whiteman, Martin and Hobart following the successful dedication of the silhouettes on the Medina Riverbank. The short ceremony on Wednesday was well attended and included a blessing by the Vicar of Carisbrooke Marcus Bagg, with flowers laid by the Vice Chairman of the Isle of Wight Council, Lora Peacey-Wilcox and the Vice Chairman of the Parish Council, Jane Perry. A bugler from Medina Marching Band sounded the last post with 2 standard bearers from the Carisbrooke branch of the British Legion in attendance. Cllr Ian Ward as County President of the British Legion gave the exhortation. From the Island Echo website - link for further details. REMEMBERING THOSE WHO SERVED IN THE GREAT WAR, MANY GIVING THEIR TOMORROW FOR OUR TODAY.